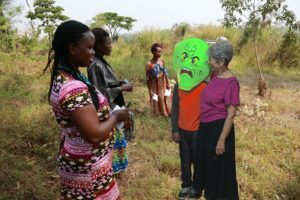 On our January, 2016 trip to Uganda members of our group gave detailed teaching, demonstration and activities related to germs, hygiene, personal sanitation feminine needs that the villagers knew nothing about! The initial activity was held at the water well drilling (bore hole) site. Pamphlets were shared describing germs common in non-well water sources. Our youngest member, “Willie Worm” explained visually the troubles dirty water cause!